Struggling to support her family after her husband’s death, Caroline Harding attracts the attention of the ruthless Captain Francis Grafton who offers her a devil’s bargain to pay back her debts to him. Outwitting her enigmatic employer and unwillingly gaining his approval significantly changes her life for the better, but can she win his loyalty and his heart when he appears to care for nothing but profit? 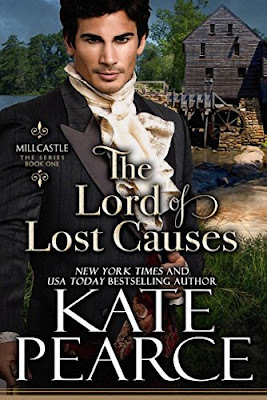 I have been a big fan of Kate Pearce's books for a while now, and this book is a great start to a new series. Oh my what a strong woman Caroline is, well she had to be, because when her husband died, Caroline, her mother and her sisters had to move back to England from India. But when they returned circumstances were against them and her mother was living beyond their means and got them into debt. Which resulted in Caroline taking a offer. Captain Grafton or Francis, wow what a man yes he is everything that I love in a man. He is also arrogant and very sure of himself. Please don't let that put you off him, he does have a reason for this. He is also driven by money and to be powerful, that is until he meets Caroline and he realises that Caroline challenges him in ways that a woman hasn't done before. But underneath that hard exterior he does have a caring heart, which you will find out in the book. If you are a fan of Ms Pearce's books, then you are going to love it. If you are new to her books, then this is a great book to start. I will give this book 5/5 stars. The book is on pre-order at Amazon UK and is available to buy from 30th April.